Back in December I highlighted Pet Lions as one of the best emerging Chicago bands of 2008 solely off the strength of a handful of demos on their MySpace site. At that time they were still putting the finishing touches on their debut EP, “Soft Right,” which is now available to buy as a download via DigStation.com. The 5 song collection definitely delivers, solidifying the foursome’s status as a band you should get on your radar as quickly as possible. On first listen, Pet Lions come across like a slightly poppier version of The Strokes, with lead vocalist Karl Østby sounding a bit like he could be the better-adjusted younger brother of Julian Casablancas. Listen more closely, though, and you’ll hear that the band owes just as much to late-70s and early-80s power pop and new wave, with a focus on strong, airy melodies throughout and plenty of clever lyrics to add to the classic pop spirit of the tunes. That’s not to say the Lions lack their own identity. There’s a distinct, buoyant guitar sound here that gives the material its own flavor. Pretty impressive for a band that’s so far only released five songs. “Soft Right” begins with “Roman History,” the most instantly accessible of the bunch. This one has the most obvious Strokes vibe, sort of like a cross between “Hard to Explain” and “12:51,” only catchier. There’s not a weak track to follow, but other highlights include “Stuck at the Bottom” and the excellent closer “Girls of Athens,” which are simply great pop songs bursting with hooks, energy and melody. Based on the strength of this EP, it would be thoroughly surprising if the Lions don’t find themselves with droves of fans very soon. Highly recommended. 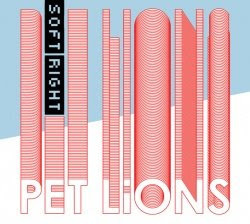 Pet Lions will play a release show for “Soft Right” March 7 at Beat Kitchen. Click here for more info and tickets.